William of Ockham (c.1285-1349) was a writer and philosopher born near Ockham, in Surrey, whose thinking and writing is considered to have laid the groundwork for modern scientific inquiry. His most famous idea is known as 'Ockham's Razor', which states that the simplest or most obvious explanation of several competing ones is the one that should be preferred until it is proven wrong. He was noted for his insistence on observation as a tool for testing reality. This manuscript has the arms of William Grey, Bishop of Ely (1454-1478), and an inscription recording his gift of it to Balliol College, Oxford. 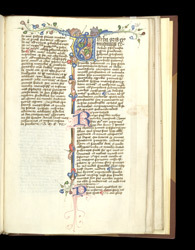 The text is divided into two parts; this page contains the end of Book I and the start of Book II, marked by an initial 'U' with partial borders.